Pierre Gattaz became President of BusinessEurope on 5 July 2018. Until then, he held the Presidency of BusinessEurope’s French member federation MEDEF. A graduate of Telecom Bretagne (l’Ecole Nationale Supérieure des Télécommunications de Bretagne) and holder of a Certificate in Administrative Management from the George Washington University (USA), he was a project engineer and export project manager at Dassault Electronics from 1984 to 1989. From 1989 to 1992, he was Managing Director at Fontaine Electronics, then Convergie (a subsidiary of the Dynaction Group). 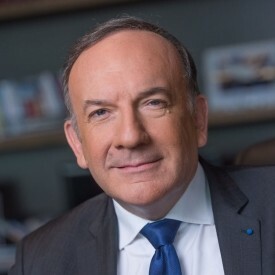 Pierre Gattaz became Managing Director at Radiall in December 1992 and has been the Chairman of the Board since January 1994. He was President of GIXEL (Professional Association for Electronic Components Systems, Digital Identity Industries) from 1999 to 2003, and then President and founder of the FIEN (Digital and Electronic Industries) from 2002 to 2007, before being elected President of the FIEEC (Federation of Electrical, Electronic and Communication Industries – 30 industrial unions) in 2007, when he also joined the Executive Committee of MEDEF (Movement of French Enterprises). From June 2010 to July 2013, he was also President of the GFI (Group of Industrial Federations - 17 industrial federations representing 80% of French industry) and a founding member of La Fabrique (the Industry’s Think Tank). Pierre Gattaz is Knight of the French Legion of Honour and Officer of the Order of Merit.